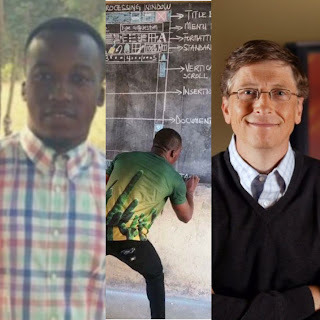 On February 15, 2018, teacher Owura Kwadwo became an internet sensation after a picture of him teaching ICT. The topic for the day was to teach the students “Features of a Word Processing Window/Microsoft Word”. Unfortunately, the school had no computer to be used by the teacher to facilitate the process. This compelled teacher Kwadwo to draw vivid Microsoft Word page on the blackboard with the parts well and visibly labelled. See picture below. Owura Kwadwo’s infamous Facebook post has been featured in many publications across the world including BBC and CNN. “Teaching of ICT in Ghana’s school is very funny. ICT on the board paa. I love ma students so have to do wat will make them understand Wat am teaching. #committedteacher. #ICTontheboard. #Teacherkwadwo”. 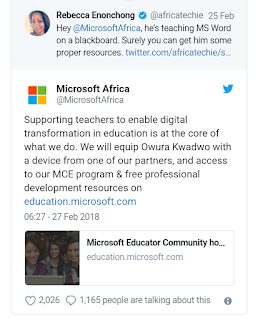 Rebecca Enonchong went the extra mile to tag Microsoft Africa in her tweet to make them aware of the situation in Africa for the help the Teacher and the school with resources to facilitate the teaching of ICT in the school. Well, Microsoft replied assuring to help Owura Kwadwo with the necessary resources. Supporting teachers to enable digital transformation in education is at the core of what we do. We will equip Owura Kwadwo with a device from one of our partners, and access to our MCE program & free professional development resources.